This 6-Day Trek takes you around the remote peninsulas near the historic Costa Verde town of Paraty. Crossing from one beautiful beach to the next, staying in simple fishing villages only reachable by trail or boat, you also trek through Atlantic Rainforest, visit waterfalls, mountain peaks with sensational views, and finally the beautiful Saco do Mamangua inlet. Our Hiking Tours of Brazil are all basic ideas that can be tailor-made to match your requirements. Any tour can include one or more destinations, and can be purely dedicated to hiking, although some mountains may include a little climbing that is still suitable for those without much experience. We can also arrange serious climbing trips. We can also mix them with other activities such as climbing, kayaking or tandem hang-gliding flights, some regular tourism, and some nightlife. We include all that you need during your trip, the accommodation with breakfast; all airport transfers and other road journeys; any activities and excursions with English-speaking guides and relevant entrance fees; plus some popular extras. For our Hiking Tours of Brazil, you only need to bring your favourite hiking boots and regular outdoor clothing and equipment. Any parts where a little climbing is necessary will include ropes, helmets and safety harnesses. All hikes and climbs are undertaken with an experienced, qualified local guide, with activity insurance included. All other equipment such as kayaks, mountain or road bikes, and of course your hang-gliding wings will be provided! This 6-Day Paraty Peninsulas Trek takes you around the remote peninsulas near the historic Costa Verde town of Paraty. Crossing from one beautiful beach to the next, staying in simple fishing villages only reachable by trail or boat, you also trek through Atlantic Rainforest, visit waterfalls, mountain peaks with sensational views, and finally the beautiful Saco do Mamangua inlet. Combines With: Rio de Janeiro; Ilha Grande; Sao Paulo; Petropolis to Teresopolis Trek. Best Time to Visit: This tour can be taken all year round with December to February being the hottest, most humid and busiest months, but also with more rainfall. April to July or August are the months that give the best chance of good weather, warm but not hot or humid, and with clear blue skies. Day 1 : Arrive in Paraty! Leaving from your accommodation or one of the airports in either Rio de Janeiro or Sao Paulo, you transfer around 4 hours along the Costa Verde to Paraty, the historic jewel of the most spectacular coastline in Brazil. You have the rest of the day free to enjoy a wander around the cobbled streets of the old town, with its baroque churches, colourful mansion houses, and lively squares. If you prefer a little exercise, we could also include either an hour or two of exploring the bay by stand-up paddle boards, or a longer trip by ocean kayak, visiting islands, hidden beaches and passing through the mangrove channels. Evening is free to enjoy the best caipirinhas in Brazil! 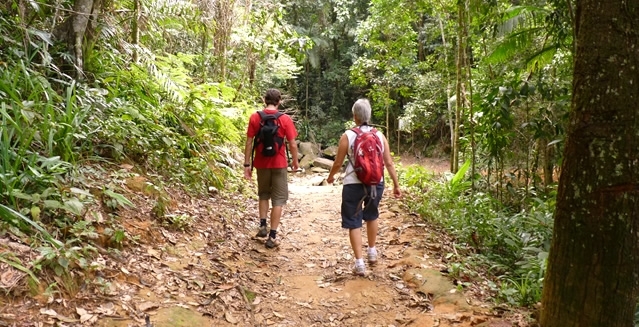 Your Paraty Peninsulas Trek begins with the short road journey up and over the Laranjeiras Peninsula to the trailhead. It begins with an easy trail over the headland from the village of Laranjeiras, through Atlantic Rainforest on an open trail to Praia do Sono. This is the first stretch of Costa Verde paradise that you traverse, followed by Antigos and Antiguinhos. Every beach has the chance to swim in crystal clear waters and explore amongst the rocks on any of the beaches. Lunch and dinner are simple meals in one of the restaurants of the local fishing communities, including the final stop at Ponta Negra. Easy/Moderate Day with 3hrs of hiking. The village of Ponta Negra is the base for your day. After waking up early to the sounds of the sea and the village, you have all the time you need for a swim and a walk before breakfast. The day begins with the hike up through the jungle trails to Saco Bravo, a waterfall that descends down the rocks to form its own natural infinity pool overlooking the Atlantic Ocean. The pool provides the perfect cooling off place after a hike of 3 hours or so. You return by the same path to Ponta Negra, where a swim in the cove should refresh you after a hot day's hiking. Dinner is again in the village. Moderate Day with 4-5 hrs of hiking. Pedra da Jamanta is the highest peak in the peninsulas, at 1,098m. It takes a tough full day to get up there and back down the same way, and is possible only with a local guide and only for people with a very good level of physical fitness, trail experience and trail resistance. If not then the trek can be cut by a night. Otherwise, the 8km trail takes you first back to Praia do Sono to meet your local guide, and then steeply up the valley behind the village, on a little-used trail that is always difficult and never so clear. Winding up through the rainforest, you eventually come out onto the rocky peak, with views along the coast towards Trindade and way beyond. After leaving Ponta Negra, the day is spent hiking the wild side of the Juatinga Peninsula. The Atlantic Rainforest drops directly into the sea for much of this journey as the path hugs the coastline looking out onto the open ocean until Praia Martim de Sa. This is perhaps the most remote point of the trek, a tiny stretch of sand that many people feel is the best beach of the Costa Verde and perhaps anywhere! The hike continues over the headland to Pouso da Cajaiba, a tiny fishing village where you can relax looking out over the Bay of Angra dos Reis. Moderate/Challenging Day with 6-7 hrs of hiking. In the morning you wake up with the sun rising out of the sea in front of you, and the chance for a dawn dip in the waters. The day's hiking begins before the sun gets too high, with the trail hugging the Juatinga Peninsula coastline through the final part of the nature reserve. There are freshwater pools along the route to cool off before the trail heads up and over to the Saco do Mamanguá, known as the only tropical fjord in Brazil. This unspoiled paradise has mountains covered with Atlantic Rainforest towering up on each side as you cross the fjord to your accommodation. Moderate/Challenging Day with 5-6 hrs of hiking. The morning view from your accommodation includes the imposing shape of Sugar Loaf Mountain (no, not that one! ), at 1,600ft/500m. Morning brings a hike up to the top for views that encompass a wide range of the Juatinga and Laranjeiras Peninsulas, with the highest Costa Verde peaks and many of its islands also visible. If you can pull yourselves away from one of our favourite views in Brazil, after the descent comes lunch on the beach and the boat across the inlet before the final hour of hiking over to Paraty Mirim, the village port where slave ships arrived. Paraty is a short drive from here. Challenging Day with 3-4 hours of hiking. With your flight home from Rio de Janeiro or Sao Paulo likely to be overnight, you have the morning to relax and recover from your Costa Verde exertions. Time maybe for a wander around Paraty to buy some souvenirs or art work. This Paraty Peninsula Trek can also be extended to include a peak or two in the difficult central part of the peninsula, with Jamanta and Cairuçu both being over 1,000m up and back down. You can also spend more time to enjoy some coastal kayaking, either close to Paraty or around Saco do Mamangua. 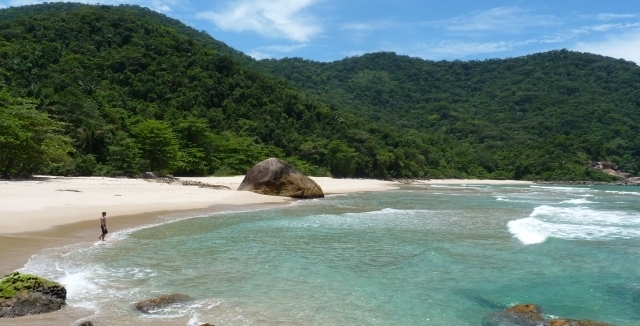 It also combines well with active stays in Rio de Janeiro and the nearby paradise island of Ilha Grande.